Love dressing up and looking glamorous ? You are not alone, with it’s ancient meaning of magic or enchantment, and a modern interpretation ‘an air of compelling charm, romance and excitement’ we have begun to associate the word with looking beautiful, designer clothes and a finished polished look. Now, to complete this glamorous look no woman should be without a pair of real pearl drop earrings. For centuries, pearls have dominated a woman's wardrobe. Indeed the ancient Greeks believed that the giving and wearing of pearl jewellery such as pearl earrings promoted marital harmony and a long lasting marriage. A beautiful pair of cultured pearl drop earrings should be free of blemishes and lustrous in colour. Audrey Hepburn, Grace Kelly and Jackie Kennedy were the glamour icons of their day all sporting beautiful pearl drop earrings to finish their glamorous look, whilst more notable modern day glamour pusses could include Sharon Stone, Katherine Zeta Jones or Julia Roberts, all setting the trends for jewellery and accessorise. There are some gorgeous classically alluring dresses available to choose from, so you can ditch the frills, puff balls and bow trimmings for sleek chiffon, velvet or gentle swarovski sparkles without the overkill. Accessorise with pearls – take a look through our collection of pearl earrings to start with – pearl drop earrings including both freshwater pearls and faux pearls in a myriad of colours – white, pink, black, champagne, blue, or green, the choice is yours. We are adding to our collection all the time, and recent additions include faux pearl and diamante drop earrings, as well as an award winning* collection of diamond and cultured pearl earrings. Truly glamorous girls will finish off their look with feminine long gloves, worn with a pearl and diamante bracelet over the top for a touch of sparkle; Then finish the whole look off with some modern diamante and pearl drop earrings or freshwater pearl studs. Complete the look for some diamante sparkly for a red carpet event, and stand out from the rest of the possee. 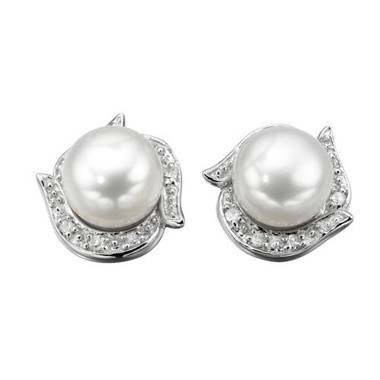 These gorgeous pearl drop earrings are perfect as wedding jewellery. The men will of course compliment you perfectly, dressed in black tie and cumberband, they can't fail to look dashing! Attending a champagne reception? With your beautiful sleek dress, fabulous pearl drop earrings and long slender gloves you'll look every bit the glamour puss, alluringly sipping your champagne! If you are a shop owner looking to stock our range of pearl and diamante jewellery then do take a look at our wholesale bridal jewellery pages of the website or call us on: 0121 705 2244 for further details and a catalogue.